Barry Dodson, noted veteran crew chief who helped lead Rusty Wallace to the 1989 NASCAR premier series championship title, has been selected to lead promising young racing star Steve Wallace with his team’s efforts in USAR Hooters Pro Cup Series competition during the 2005 season. The younger Wallace and his Dodson-led team will compete in a familiar No. 27 Dodge in the Southern Division of the Hooters Pro Cup Series competition. 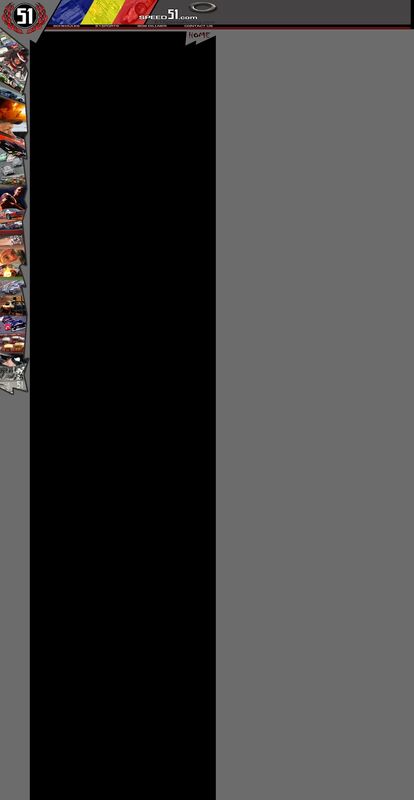 They will be competing in Steve Levitt-built chassis Dodge racecars that will be powered by Maurice Petty-prepared power plants. Wallace will be a candidate in the $90,000 Miller Lite Rookie of the Year Program this season. 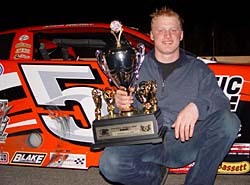 Steve turned heads when he won the Snowball Derby in 2004 at the age of 17. The 2005 Hooters Pro Cup schedule opens on Saturday, Feb. 26 at USA International Speedway in Lakeland, Fla.
Dodson began his illustrious 30-year racing career with Richard Childress in 1971 and has had focal roles in many top teams through the years since. He has been a key team leader at Petty Enterprises, M.C. Anderson Racing, Blue Max Racing, Darwal Racing, Sabco Racing and Ultra Motorsports. He was named a first-team All-Pro crew chief three times and was a recipient of the 1998 Maxwell House True Spirit Award and the 2000 Indianapolis Motor Speedway True Grit Award. Dodson, a 51-year-old native of Rural Hall, N.C. resides in Mooresville, N.C., with wife Jan. He enjoys golf and fishing and is known for his love of Wake Forest University athletics. to drive, but now he’s really learning how to race and that’s where we think we can be the most help – teaching the patience and bridling the great aggressiveness that Steve has. 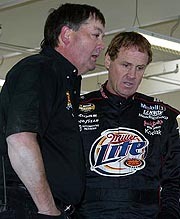 Rusty Wallace has tabbed Barry Dodson (left) to head Steve Wallace's efforts in the ProCup Series.